The 05-06 season was a huge turning point in the boys’ basketball program at ICS-Seoul. This would mark many “firsts” in school history. 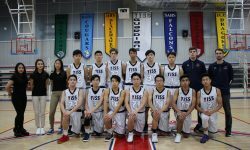 ICS would win both the Division II regular season and tournament for the first time with an overall record of 28-11, beating Pusan 3 times out of 5 in season and tournament play. This would also be the first year the team would make a run at Far East, finishing in 4th place. The team was led by senior captain and surrogate coach Paul Park and senior captain Ryan Kim. All-conference honors went to Ryan Kim, who set a school record for career three pointers during this season, and now-junior Joseph Choi. Ryan also was awarded KAIAC all-tournament. Daniel Hale also joined the team as an assistant coach as Coach Malcolm moved out of country. This was a successful and rewarding season for the players and coaching staff and saw much of the team’s dedication and hard work pay off.